Right in the heart of Boise State University’s campus and the city of Boise, Taco Bell Arena opened its doors in 1982. 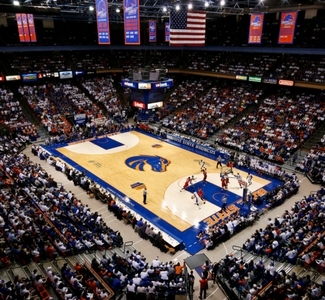 Taco Bell Arena has a capacity of 13,390 seats and is the home of the Boise State Broncos basketball, gymnastics, and wrestling teams. Recognized as one of the finest basketball arenas in the West, Taco Bell Arena prides itself in being a tough place for Bronco opponents to pick up a win. With the state of the art video boards over the court, new ribbon boards, and a new sound system fans will never miss a second of the action. View upcoming events.